Great news for the West Coast! 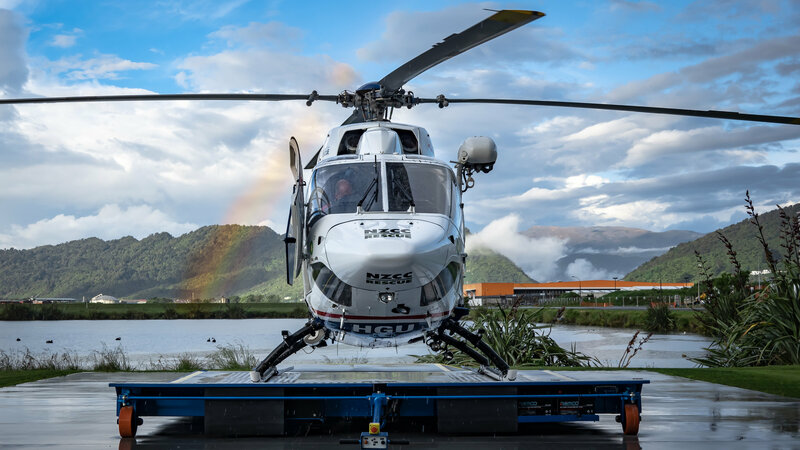 Thank you to all of our West Coast NZCC Rescue Helicopter service supporters who came along to view the twin-engine BK- 117 now based in Greymouth. We met on the 14th March at the hangar and the rain held off long enough so most had a chance to see the new helicopter. It was also a great opportunity to meet some of the new crew members who have joined in the last 3 months. New crewman, Brent Hollow, talked about his first impressions and all of the training he has done, with still more to come. Daniel Currie – CFO of GCH Aviation explained the advantages of having a twin-engine machine with increased maneuverability and a larger cabin for the medical crew to better treat the patient. Another very important feature is the ability of this helicopter to land on the new Christchurch Hospital helipad once it becomes operational – hopefully later this year (a single engine cannot land in such a way), meaning patients will arrive at the hospital much faster. The event was a great opportunity to acknowledge our sponsors:- NZCC as naming rights sponsor and their exceptional level of commitment that will continue into the future, Electronet and Westfleet, and also our friends at Mitre 10 and the Ashley hotel who support our crew members when they spend time on the West Coast. It was wonderful to have a group from the Freemasons in attendance; they have been instrumental in buying essential equipment in recent years . Westpac also joined us at the event and are forging links with other supporters to drive activity during the May Chopper Appeal time. We also hosted some individual patients and donors – thank you again for all of the support.